Originally published under the title "Textbooks and the Armenian Genocide in Turkey: Heading Towards 2015." Education is extremely centralized in Turkey. All issues, including setting policy, the administration, and content of education are decided and implemented by the national government. Textbooks that are to be taught in schools are either prepared by the Ministry of National Education (MEB) or must be approved by the Ministry's Instruction and Education Board. For this reason, there's a direct connection between the books taught in schools and the Turkish government's policies. The content of history textbooks, in particular, reveals firsthand information about government policies and goals. The MEB made elementary and middle school textbooks available on the internet for the 2014-15 school year. Anyone can now download and read these books. I did a quick review of the history books that are to be taught this year, to see what is being taught to our children about the Armenian Genocide. I have to characterize what I found as both shocking and saddening. Firstly, the textbooks characterize Armenians as people "who are incited by foreigners, who aim to break apart the state and the country, and who murdered Turks and Muslims." Meanwhile, the Armenian Genocide—referred to as the "Armenian matter" in textbooks—is described as a lie perpetrated in order to meet these goals, and is defined as the biggest threat to Turkish national security. Another threat to national security is missionaries and their activities. Secondly, the textbooks are written in a very slipshod and haphazard manner. Even the most perfunctory Google search would improve the content, it is so filled with blatant errors. At the risk of offending some people, it is as if the text was written with an arrogance marked by the sentiment, "Put out a bunch of crap; the yokels won't know the difference." In my opinion, these textbooks constitute a supreme act of disrespect towards the students of present-day Turkey. Third, these textbooks are required reading in Armenian schools, as well. The only Armenians schools in existence in Turkey are presently located in Istanbul. As of 2014, there are a total of 16 schools, and of these 11 are K-8 schools and 2 are high school level. There are about 3,000 students in total. In history classes, which are required, these students are taught that they are "traitors and societal elements that murdered Turks and are easily incited" and that their problems constitute "a threat to national society." One can't help but see that this is a purposely driven attempt at "identity destruction" by the Turkish government. It is also possible to detect a policy of elimination by examining these schools and the change in the number of students over the past 40 years: "There were 32 schools during the 1972-73 school year, 7,336 students…during the 1999-2000 school year the number of schools was 18 with students numbering 3,786. There has been a 50 percent decrease in the number of schools and a 60 percent decrease in the number of students over the past 40 years." Those who present this data consider it "a complete disaster," and that is an accurate assessment. One needs to evaluate what's written in the books in light of another source of information. Leading up to the prime minister's election of 2015, the AK Party, which has been the ruling party of Turkey for the past 13 years, and its leader Recep Tayyip Erdogan, have initiated a new project called the New Turkey Project. A "vision statement," which consists of chapters and titles under "Democratic Administration," "Prosperity State," and "Trailblazer Country," was also prepared for this project. A free and democratic Turkey is promised by the New Turkey Project. The party has also published a book called The Silenced Revolution, Turkey's Democratic Change and Transformation Inventory 2002-2012," which describes its achievements during the 2002-12 period and, more importantly, explains its philosophy. In order to better understand what's written in the textbooks and to make a proper comparison, it's helpful to present a few quotes from this book: "We have taken significant steps in the fields of democratization, law, and the fight against terrorism, each of which is deemed the 'silent revolution.' We have never made concessions with regard to democracy, security, or freedom. We have embraced a paradigm-shifting approach as our foundation in order to restore peace in the society and developed a new 'security paradigm'… This revolution has introduced an understanding that recognizes differences as diversity and puts the emphasis on serving the citizens instead of a statist approach which sees its own citizens as a threat." Based on both the various claims that were voiced in this book and in the context of the New Turkey Project, a group of intellectuals and writers, known for their progressive-democratic views, announced that they supported the AKP and its project. Additionally, they invited all Christians and Jews, especially Armenians, to become the founding pillars of this New Turkey. Those who did not accept the invitation faced very harsh criticism. According to these intellectuals, the AKP under Erdogan's leadership rolled up its sleeves to establish a new and democratic Turkey, and the right position to take was to accept the invitation to become a founding member and support the AKP. The textbooks characterize Armenians as people "who are incited by foreigners, who aim to break apart the state and the country, and who murdered Turks and Muslims." Another major point made by those who believe the AKP is sincere in working towards a New Turkey is that Erdogan, on April 24, 2014, extended his condolences for the Armenian losses of 1915. This was truly a first! Both this public expression of condolence and the fact that Foreign Minister Ahmet Davutoglu continues to make statements about approaching history with a "just memory" in different settings (i.e., the idea that both Turks and Armenians have suffered equally) made it seem as though Turkey was ready to initiate a new phase on the lingering Armenian-Turkish conflict. After Erdogan's condolences, Davutoglu made frequent statements to the effect that "we've done what we need to do on this issue; now it's the Armenians' turn." It would be fair to say that this and similar arguments propelled those who take a deep interest in the subject, particularly in light of the upcoming 100th anniversary of the genocide, to begin feeling hopeful. For all of the above reasons, I decided it was time to take a look at Turkish textbooks. There's so much you can learn about a country through what is taught to the young, the custodians of the future. It is there that we can see for ourselves what kind of New Turkey the AKP is planning on promoting, and to confirm claims that they have backed off from seeing and presenting their own citizens as enemies of the state. Specifically, we can see how they perceive Armenians. As we say in Turkish, textbooks truly are where "the clarinet toots its tune." This is what I found: Turkish history textbooks are filled with the message that Armenians are incited by foreign sources, want to partition the country, and kill Turks and Muslims. They direct their own citizens to view a specific citizen group (Armenians) as the enemy. In addition, they define the "Armenian Problem" as the biggest threat to national security and urge Turkish youth to be vigilant against this threat. One should add that this information continues to be taught to Armenian children, without exception, just as had been done in the past. There's nothing new about the New Turkey. Everything here is a repeat of what's been going on for decades. The AKP continues to promote a national security concept that's been the modus operandi of past authoritarian regimes under military tutelage and the "hit" team, which was formed by the military, the Ergenekon organization that AKP claims to have now suppressed. Without going on too much further let's move on to the textbooks. This book was written for the 8th grade by Salim Ulker. In accordance with a decision dated May 31, 2013, and numbered 29 by the MEB Board of Instruction and Education, it was approved as a textbook for a 5-year period. In actuality, there are two separate books. One is the textbook and the other is the student's workbook. The Armenians and 1915 are covered in the seventh unit of both books. 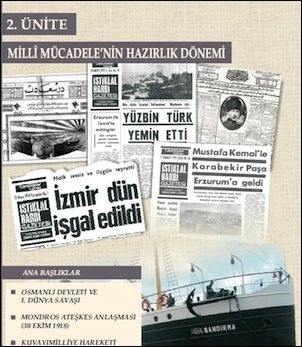 The heading of the unit is "Turkey after Ataturk: The Second World War and its Aftermath," and the fifth topic deals with threats against Turkey. The heading states, "In this subject we are going to learn about internal and external threats to our country and that we must be vigilant against these threats." The goals of these threats are defined as "destroying the state's order." What then constitutes the first and primal threat? "Turkish-Armenian relations." The question children are asked to debate is, "What should be done to promote our country's justification against Armenian claims?" Stating that "we have duties in relation to the internal and external threats against our country," students are invited to "be conscious of these threats." After teaching that the Armenian issue is a national threat, a homework exercise is presented in the student workbook. The title of the ninth activity is "The Powers that Threaten Turkey and National Security," and the homework given to students is: "Next to the sources of threats against our country, which are written below, write on the dotted line what should be done both as a country and as a citizen." What did I say was the biggest threat? You didn't read this wrong: It is the "Armenian matter," "Armenian claims." Students are additionally asked to research "the primary duties of the National Security Board, which was formed in furtherance of our national politics because of the threats against our country." I feel compelled to add one more note here. Ever since Hrant Dink's murder by a young man, frequent soul-searching has led many to wonder, "Where do individuals who commit murders like that come from?" It seems apparent what the answer is now. They get trained in Turkish schools! This second book was prepared for middle school education; there's no indication which year it is meant for specifically. The book was written by a commission and approved as a textbook by the MEB Board of Instruction and Education in a decision dated Dec. 8, 2011 and numbered 261. It is a publication of the Ministry of National Education. In this book, the Massacre of Adana, which ended with the death of 20,000 Armenians in 1909, is identified as "The Rebellion of Armenians of Adana." This is terminology that even the Union and Progress Party (CUP), which was in power at the time, didn't use. In fact, the CUP and its ally, the Dashnaktsutyun (Armenian Revolutionary Federation) released a joint declaration in August 1909 criticizing the massacres as "enacted against the revolution, as a counter-revolutionary action" and stating that they would continue to work together against attempts by counter-revolutionaries to oppose the constitution. In other words, the visionaries of today's New Turkey are way behind the Unionists of 1909. According to the book, the law, which authorized the deportation, arose as a product of necessity, but the deportation had another very important role—protecting and saving Armenians. From who, you ask? Other Armenians. There is a great deal of information in the book that can be considered outright falsehoods. Stating that the first Armenian socialist organization, known as the Hnchaks, was "established in 1877 by the Armenian Patriarch Zaven Effendi" is just one example of the many errors throughout. Neither the year of formation nor naming Patriarch Zaven as the founder is true. When the organization was formed in 1887, Zaven, who would later take on the role of Armenian patriarch of Istanbul, was a mere child of 9. This kind of information can be easily gleaned from the internet. The book addresses the genocide under the heading, "1915 Armenian Events." It starts with the kind of banal statements that are low on facts and that we've heard hundreds of times over—that is, that the Armenians sided with the Russians during the war. It goes from there to describing how the Hnchak and Dashnak organizations instituted rebellions in many parts of Anatolia. Not only that, but these organizations "didn't hesitate to kill Armenians who would not join them" and even issued instructions that "if you want to survive you have to kill your neighbor first." Based on this, Armenians murdered "many people living in villages, even children, by attacking Turkish villages, which had become defenseless because all the Turkish men were fighting on the war fronts." The Armenians didn't stop there. "They stabbed the Ottoman forces in the back. They created obstacles for the operations of the Ottoman units by cutting off their supply routes and destroying bridges and roads." Then, as if that wasn't enough, "They spied for Russia and by rebelling in the cities where they were located, they eased the way for the Russian invasion." According to the book, it was inevitable that certain precautions had to be taken to prevent collaboration between the Russians and Armenians, especially when there was a life-and-death battle going on in Gallipoli. According to the book, the law, which authorized the deportation, arose as a product of necessity, but the deportation had another very important role—protecting and saving Armenians. From who, you ask? Other Armenians. This is not a joke; this is seriously what the book claims: "Since the Armenians who engaged in massacres in collaboration with the Russians created a dangerous situation, this law required the migration of [Armenian people] from the towns they were living in to Syria, a safe Ottoman territory." Despite being in the midst of war, the Ottoman state took precautions and measures when it came to the Armenians who were migrating. Their tax payments were postponed, they were permitted to take any personal property they wished, government officials were assigned to ensure that they were protected from attacks during the journey and that their needs were met, police stations were established to ensure that their lives and properties were secure. There are also plenty of inaccuracies and outright lies in the book about the 1919-23 period, what is known as the Turkish War for Independence, but I will let other historians write on that issue. Another history book written for the 10th grade was "approved as a textbook by the MEB Board of Instruction and Education in a decision dated May 4, 2009, and numbered 67. The book covers the period from the establishment of the Ottoman Empire through the Republic, and so the Armenians appear throughout, from the early period of Ottoman administration until the end of the empire. According to the book, under the administration of the Ottomans, the Armenians lived a life that was pure heaven, plain and simple. Since the early Ottoman era isn't one that I deal with in my research, I will skip what's said about that period. For the first time in the Ottoman state, the Armenians, who had been incited by the Russians, had also rebelled. Working in conjunction with the Russian Army, Armenian bandit militia were able to place Turkish soldiers between two firing fronts. Based on this development the Ottoman state was forced to propose a ceasefire from Russia. Needless to say, there is no historical account of an Armenian uprising, nor of separate Armenian bandits or militia units attacking the Ottoman Army from behind. This is a first-class fabrication. The book is filled with similar nonsense that cannot be taken seriously. For example, under the subheading "The Incitement of Armenians and Their Organization," it propounds this claim to describe how the Armenians were incited by foreign powers: "The Armenians who were living under the Ottoman administration had not been influenced by the French revolution. This situation changed after the Russians got involved." Another similar claim is that during the war of 1877-78, Armenians committed atrocities against Muslims. It is extremely upsetting to see that the youth of Turkey are being educated by way of this heap of garbage that can't rightly be called scholarly information. It is quite interesting what the book relates of the Abdulhamit period of 1894-96, when between 80,000-300,000 Armenians were massacred. In actuality, nothing is said at all because according to the book there were no massacres during this period; no Armenians were killed. The only thing that happened was that the Armenians were incited and, as a result, had an uprising. This information is presented under the heading, "The Problems that Armenians Created." To provide a few examples of the information that's presented: "The Armenian committees instigated their first rebellions in 1890 in Erzurum and Adana. In 1893, they killed 25 soldiers after firing upon security forces in Merzifon." The most violent of the Armenian uprisings occurred in Sason and "the Armenian community there was urged to stop paying taxes to the state and to kill Muslims." Armenians also "engaged in uprisings in Kayseri, Yozgat, Corum, Zeytun, and Kahramanmaras." The Armenian organizations spread their uprisings all over the place and "they even killed Armenians who wouldn't take part in them." At one point, a heading asks students, "What could be the reasons the Armenian terrorist organizations spread the uprisings throughout the country?" The information given in the book about the 20,000 Armenians murdered between April 14-16, 1909, during the Adana Massacre is not much different. According to the book, Armenians rebelled and murdered Muslims, and the Ottoman rulers had to suppress the rebellion. It states simply, "Armenians instigated a massacre in Adana and Dortyol in 1909 by attacking Muslims." The ringleader of the rebellion had been "Armenian Bishop Museg" and "once the Ottoman state had suppressed the rebellion, he escaped to Egypt." This rather strange bit of information doesn't stop there. After the events in Adana, "European public opinion again started to turn against Turkey. The Union and Progress administration of the Ottoman government signed a treaty that would encompass some reforms to be performed together with Russia (1909). According to the treaty, Russia would have the last say in any reforms that were to be agreed to regarding the Armenians." There was neither a rebellion in Adana nor was there ever a Reform Treaty signed with Russia in 1909. These are all figments of the writer's imagination. When it comes to the subject of 1915, the writing gets even more bizarre. The information on the topic is presented under the heading, "The Armenian Problem During the World War I Years" and starts with this sentence: "The entry of the Ottoman state into World War I was viewed as a great opportunity by Armenians…by invading Erzurum, Erzincan, Mus, and Bitlis in Eastern Anatolia, Russia further incited the Armenians in these regions." The internal contradictions presented by this information alone are a serious problem. For example, the Russian units invaded the cities mentioned above in April 1916 and later. At that date, the deportations had all been concluded and the Armenians had been annihilated. So, for example, when the Russians entered Erzurum, there wasn't a single Armenian around to incite. When you see what's been written under the heading "Armenian Deportation," you start to wish things had ended with the account about Russians invading. 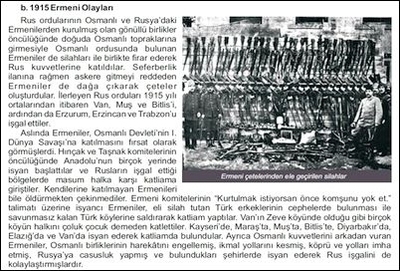 It goes: "The Armenians who were armed by the Russians, started to engage in massacres raiding Turkish villages. … While the Ottoman state was in the middle of a life and death struggle in Gallipoli, Armenians escalated their activities towards a complete rebellion. "Ararat," the official newspaper of the Armenian organizations, published the declaration below describing the actions that Armenians were going to take (August 1914)." 1 – Every Armenian, regardless of who they are, should sell some of their worldly goods and arm themselves. 2 – Armenians who are called to arms under the announcement of mobilization shall disobey the command; they shall forbid anyone around them, including Muslims, from joining the army. 3 – Armenians who have been conscripted into the armed forces, however this may come about, shall escape the army and join the Armenian gangs and volunteer militias. … 6 – All Muslims above age 2 who are seen behind army front lines shall be murdered at every opportunity… 7 – The food, goods, and property of Muslims shall be confiscated or burned and destroyed. 8 – They shall burn down the homes, grains, churches, and pious foundations that they abandon and spread the word that Muslims caused it. 9 – They shall set fire to official state buildings and murder Ottoman police and gendarmerie. 10 – They shall kill Ottoman soldiers who return from the front wounded. … 14 – The price of the rebellions, revolutions, and massacres performed by Armenians is to be paid by Muslims and this shall be broadcast to domestic and especially foreign public opinion. 15 – They shall perform spying and consulting to the Entente states. The book goes on to claim that Armenians "immediately began to implement the declaration" and that "they inflicted the greatest harm to the Turkish people during the years of the First World War." It is meaningless to even engage in a discussion over whether such a declaration from "Ararat" magazine really existed. It isn't even worth saying, "Produce this document; otherwise, we'll accuse you of lying." Those who wrote and endorsed this book did it knowingly and shrewdly calculated the consequences. Their act brings to mind the Nazi Propaganda Ministry. The only reason to spend so much time discussing the aforementioned document is to show what's being taught to the youth—in the form of hate-driven emotions against Armenians. Its effect on Armenian students in Turkey can only be imagined. The book goes on to describe the so-called massacres perpetrated by the Armenians against Muslims from 1915 onward. The governor of Van, Cevdet Bey, apparently "forced a migration of Turks, which was known by the Ministry of the Interior, in order to save them from the massacres of Armenians." Turks left all of their belongings behind and started migrating, but "the migrating Turks were killed en route by Armenian gangs…without regard for women or children. While most of those who, for whatever reason, could not leave were killed by Armenians as well, women in particular were subjected to terrible treatment." The first step that the Ottoman state took was to close down "the Armenian terror…organizations in order to prevent collaboration between the Armenians and Russians and to stop the massacres." Then they deported the Armenians to Syria—"temporarily." On April 24, 1915, the government issued a directive "to close down the Armenian committee headquarters, to confiscate their records, and to arrest the committee leaders." What's been described as genocide, it claims, was this directive and the 2,345 individuals who were arrested as a result of it. However, when these actions proved to be inadequate, the law on deportations was enacted and "with this law, only those Armenians in the region who had been involved in the acts of rebellion were taken from the war zone and dispatched and settled into more secure areas of the country." Meanwhile, the communities of "Assyrians, Chaldeans, Jews, and Greeks" in the same regions were supposedly left undisturbed. The authors of the book point to this as a piece of grand truth and state that "it's quite noteworthy that these individuals were not subjected to deportation while Armenians who had joined in rebellion were." The idea that the deportations were limited to the provinces where rebellions had occurred—and that even there only rebellious Armenians were deported, and other Armenians left alone—was quite prevalent during the 1980's and 1990's. Later, it became clear from the official Ottoman documents published through the Prime Ministerial Ottoman Archives that not only were all Armenians, without exception, deported from the provinces where rebellions were claimed to have taken place, but that Armenians were deported from every province and town in Anatolia, and even cities in Thrace, like Tekirdag and Edirne, located in the European region. For this reason, these theories were abandoned, and the fact that the deportations had involved all Armenians was generally accepted. It appears that the AKP, which claims to be readying itself to establish a New Turkey and is supposedly conducting a "silent revolution," prefers to roll back the clock to the 1980's when it comes to denialist policies. The book puts forth a big claim to justify the deportations. They were enacted, it says, in order to save Armenian lives! Yes! The deportations "secured the lives of the Armenian people." But, "Who was threatening the lives of the Armenians?" The answer provided by the book is quite simple: other Armenians! The state made the decision to conduct a deportation in order to protect Armenians from other Armenians because "these [Armenian] gangs were killing Armenians who did not join in acts of terror and rebellion." Despite being in the middle of difficult wartime conditions, the Ottoman state took extraordinary precautions! "Through the publication of regulations, the Ministry of the Interior had planned how the deportation was going to be conducted down to the smallest detail." For example, "The elderly, infirm, blind, widowed, and orphaned were not subject to the deportation. … Care was taken to ensure that the locations where migrated Armenians would be settled featured agricultural fields that were fertile and police stations were established at these locations to secure their safety…and the groundwork was laid for them to continue their professions and work in the places where they were settled." Reading this, one can easily conclude that the deported Armenians were quite fortunate. Not only was their safety secured, but they were provided with every kind of opportunity despite the difficult conditions! What more could a person want? The figures presented in the book on deportees and deaths are very important. There's been a bit of a "mark–up" in the figure propounded by the former president of the Turkish Historical Society, Yusuf Halacoglu, that 30,000 Armenian casualties resulted from the entire deportation. The book states that "based on figures from unbiased researchers, 300,000 Armenians lost their lives due to war and sickness." Yet, the number of Muslims that were killed and/or forcibly deported by Armenians is way beyond this figure: Armenians killed 600,000 Turks. "According to official Russian records," it reads, "Armenians killed around 600,000 Turks in just Erzurum, Erzincan, Trabzon, Bitlis, and Van and forced 500,000 and to migrate." If the Ottoman state had indeed wished to annihilate the Armenians, would it have made sense to take so many precautions both during and after the deportation? Besides, where are the mass graves of all those people that were supposedly killed? There really isn't too much one can say after this statement. Maybe one should apply to the Turkish government for permission to engage in unrestricted excavations, using the claims in the book as an excuse? The nonsense doesn't end here, unfortunately. The book claims that Armenians who were deported were then able to return to Turkey unscathed and reclaim their properties. We all know this to be untrue. The book also covers the assassination of Turkish diplomats by Armenian Secret Army for the Liberation of Armenia (ASALA), presenting a long list of these acts. There is considerable space given to activities by the Armenian Diaspora, whose members work "to gain recognition of a so-called genocide by creating the image of themselves as people who have been subjected to persecution and injustice." It claims that the diaspora has been successful in doing so—"In some of the European states and in American schools, their claims of so-called genocide have begun to be taught in lessons"—and explains why: "because in the countries where Armenians are found, especially in the USA, they have formed a strong political unit by constituting a singular voting bloc. They have asserted and achieved their genocide related demands as a condition to any party to which they will give their votes." The book also makes some claims regarding the purpose behind both ASALA's and the Armenian Diaspora's actions. We should read these claims as reflecting the Turkish government's official viewpoint on the subject. What are the 'Four Ts'? To counter the Armenians' claims about genocide, at the end of 2001 Turkey formed the Commission to Coordinate the Fight Against Baseless Genocide Claims. This commission started scholarly studies on the subject of the baselessness of Armenian claims. Additionally, by placing the Armenian problem into school curricular programs, a process of informing young people was initiated. Also, the Commission on Higher Education (YOK) established the National Committee on Turkish-Armenian Relations. Whether or not the Commission to Coordinate the Fight Against Baseless Genocide Claims is still active has been a topic of curiosity in the public. Reading these current textbooks, one can conclude that the commission is still active—and that, in fact, these textbooks were prepared with the contribution of this commission. I have only mentioned what was written about 1915 in these three books. It would be valuable to conduct a similar review about other Christians (Assyrians and Greeks) and Jews in a way that covers the entire Ottoman period up to the Republican years. However, the picture that emerges when doing a limited review of just the events around 1915 is quite pathetic. There's nothing new about the New Turkey. Everything here is a repeat of what's been going on for decades. In these textbooks taught in Turkish (and Armenian) schools, Armenians are defined as the enemy. The young minds that we will bequeath our country to are being educated on an image of Armenians as "those who are eager to be incited, who wish to divide our country and collaborate with our enemies." Additionally, the historical problems that have been defined as the Armenian problem continue to be perceived as a threat against Turkish national security. Even if we set aside for a minute the diaspora and Armenians in Armenia, it is clear that the government perceives a segment of its own citizens and their problems to be a threat against national security, and educates all of its citizens to engender feelings of hatred and enmity towards this one segment. The situation is truly desperate. Based upon what's been written, two questions come to mind: How do Armenians who continue to live in Turkey, and who are its citizens, manage to live in this country? What is it like to live as an Armenian in a country where innocent young minds are taught to be enemies of Armenians, and where Armenians are presented as a threat against national security? If I were asked to make a proposal, I would make one single request of every individual and organization reading this article. The 100th anniversary of the Armenian Genocide is approaching in 2015. The Turkish government is going to put up smokescreens, claiming to be interested in making amends, and claiming that Armenians are the ones who keep backing away, etc. It is going to try to create the impression that it is the side that is willing to compromise and to find solutions. Please place these textbooks directly in front of them at each and every opportunity, and make it clear to them that if they want to reclaim any kind of integrity on the subject they should first pull these books from circulation. Taner Akcam, a fellow at the Middle East Forum, is the Robert Aram, Marianne Kaloosdian and Stephen and Marion Mugar Chair in Armenian Genocide Studies at Clark University. See www.meb.gov.tr//2014-2015-egitim-ogretim-yiliinda-okutulacak-ilk-ve-orta-ogretim-ders-kitaplari/duyuru/7013, Introduction: Sept. 12, 2014. Gunay Gokɪsu Ozdogan, Ohannes Kilicdagi, "Listening to the Armenians of Turkey: Their Problems, Demands and Proposed Solutions" (Istanbul: TESEV, 2011), 43. "The Silenced Revolution, Turkey's Democratic Change and Transformation Inventory 2002-2012" (Ankara: Republic of Turkey Prime Ministry Undersecretariat of Public Order and Security 2013), 10. The quote is from the introduction written by then-Prime Minister Erdogan. The most famous of those who issued the invitation and who criticized is Etyen Mahcupyan. The fact that Mahcupyan was one of Hrant Dink's closest friends and said that "had Hrant lived he would have voted for the AKP" led to some very heated debates around the subject. For an example of what Mahcupyan wrote on the subject, see www.aksam.com.tr/yazarlar/etyen-mahcupyan/bir-ermeni-olarak-e2-80-a6/haber-334649. For just one example, see www.todayszaman.com/news-346158-davutoglu-says-turkeys-1915-statement-achieved-its-goal.html, Introduction, Sept. 14, 2014. Each book can be accessed at www.meb.gov.tr/2014-2015-egitim-ogretim-yilinda-okutulacak-ilk-ve-orta-ogretim-ders-kitaplari/duyuru/7013. Salim Ulker, Ilk Ogretim T.C. Inkilap Tarihi ve Ataturkculuk 8 (Primary Education R[epublic of] T[urkey] History of Revolution and Principles of Ataturk 8), Textbook (Ankara: Semih Ofset, 2014), p. 178. Salim Ulker, Ilk Ogretim T.C. Inkilap Tarihi ve Ataturkculuk 8 Ogrenci Calisma Kitabi (Primary Education R[epublic of] T[urkey] History of Revolution and Principles of Ataturk 8, Student Workbook) (Ankara: Semih Ofset, 2014), p. 118. Commission (ed. ), Ortaogretim Turkiye Cumhuriyeti Inkilap Tarihi ve Ataturkculuk, (Middle School Education Republic of Turkey History of Turkish Revolution and Principles of Ataturk) (Ankara: MEB, 2014), 21. Dikran M. Kaligan, The Armenian Organization and Ideology under Ottoman Rule 1908-1914, (New Brunswick, N.J.: Transaction Publishers, 2011), 43-81. Commission (ed) Ortaogretim Turkiye Cumhuriyeti Inkilap Tarihi ve Ataturkculuk, (Middle School Education Republic of Turkey History of Turkish Revolution and Principles of Ataturk), 23. Vicdan Turan, Ilhan Genc, Mehmet Celik, Celal Genc, Ortaogretim Tarih 10 (Ankara: MEB, 2014). For an example of the published records by the T.C. Basbakanlik Devlet Arsivleri Genel Mudurlugu Osmanli Arsivi Daire Baskanligi (translated: Presidential Office of Ottoman Archives General Directorship of the Prime Ministerial State Archives of the Republic of Turkey), see Osmanlɪ Belgelerinde Ermeniler (1915-1920) (Ankara, Basbakanlik Printers, 1995).